With the Kanex® Digital Audio Splitter, you can separate your digital audio and video signals and send them where you want. 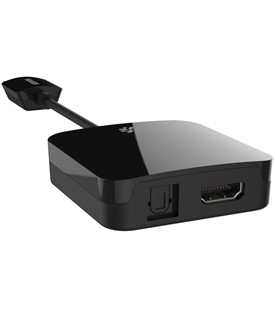 It has a male HDMI® input and female HDMI, optical, and 1/8" analog audio outputs to allow you to send video to one projector or display while audio goes directly into whatever sound system you prefer. The Digital Audio Splitter supports up to 4K resolution, 3D, and uncompressed audio formats such as LPCM, DTS Digital, and Dolby Digital. When used with a compatible Apple TV, you can split the audio and video portions of your AirPlay streaming content to the display and speaker system of your choice. 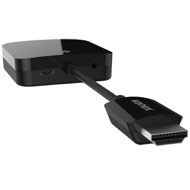 The Digital Audio Adapter allows you to stream HD content from your new Apple TV directly to your home theater system via HDMI with pristine sound radiating from your optical audio or 3.5mm audio port. Now you can listen to your favorite music, podcasts, TV shows, and radio apps with your existing home theater sound system or sound bar. Connect directly via standard digital optical or 3.5mm audio port. 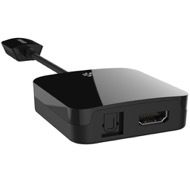 Compatible with new Apple TV, Amazon fireTV™, Nexus®, and Roku®. Stream Content Directly from Your iPad to an HDMI Projector. 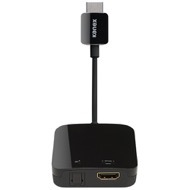 The Digital Audio Adapter allows an HDMI TV, Monitor, Projector, or Display to utilize Apple AirPlay mirroring from an iPad® to New Apple TV so you can take advantage of the latest technology. Enhance presentations and educational learning experiences. Rating: 5/5 Add Optical line to Apple TV 4 January 6, 2017 I am now able to run an optical line between the Apple TV 4 to the 5.1 sound system and now I get the full 5.1 sound and with no more audio drops. Since the Apple TV 4 does not have an optical port and my 5.1 Kenwood Audio Video VR-407 (2003) receiver equipment is old enough not to have HDMI. I had to run the HDMI directly to my Panasonic Plasma Flatscreen, TH-42PX75U (2007). Then output the optical line from the plasma back to the audio receiver. There were a couple of short comings with this configuration. The main issue was that there would be an audio drop for a second or two from time to time. I did isolate the sound issue to my flatscreen but switching to 16bit and many other varies settings did not help. The other issue was no 5.1 when I back feed the optical line from the Plasma. So the bottom line is, I have full 5.1 channels and I have my sub wolfer back. But, most importantly, no more audio drops.